Yeah, I know, if you take out the spaces in that title it reads like a long Welsh village name. Oh well, that’s pretty much everything on the band and I can’t find the keys on my keyboard for the crest that also adorns the band… so there we are. This is the torpedo, er, pyramide, vitola in the line. It’s a Dominican Puro and there’s a bunch of special stuff about the tobaccos used: they’re probably aged five years in a special corner of the Fuente Chateau and on and on. The construction looks pretty good but there are some bumps and veins and symmetry doesn’t look like it was high up on the torcedor’s list when it was made. That’s not fair, it’s a well made cigar but, for the money, I was expecting perfection. But, like I’ve said in the past, it’s the taste that matters most to me and this does look good enough to satisfy those who care about such things like how good a cigar looks. How Many 5-year old’s Could you Take in a Fight? Flame! A splendid mixture of candied fruit, sweet spice, cedar and leather. The fruit and spice are more in the foreground and the others are definitely supporting characters with some strength. Whereas the Opus X’s I’ve smoked have more of an intensity to them this cigar has more well rounded edges to it. It’s good and a very slow burner. Resonating flavors that really come to life during the second third bounce around the palete like an excited quark on its first day of element school. Flavors are roughly the same as the first third but with more of an emphasis on the sweet spice and leather. Very nice flavor profile; while the flavors aren’t very robust they are still pretty strong in their own right and they are also interesting. During the final third, the flavor profile does seem to have run out of some steam. Cedar and leather make up the brunt of the flavor profile at this point and it’s all falling a bit flat without the spice and the sweetness from the first two thirds adding in that extra dimension of flavor. It’s still enjoyable but not nearly as much as it was. Medium-full bodied with a good draw and burn; this Fuente Fuente Opus X Forbidden X Lost City was very good during the first two thirds but fizzled out a bit during the final third. I suppose if you want to quit smoking this cigar around the end of the second third then it would all be very enjoyable but this is a review and reviewing cigars in thirds seems to be an industry standard of sorts. Still, even when you do lump in the final third with the first two it is an interesting and enjoyable cigar. More so than most. 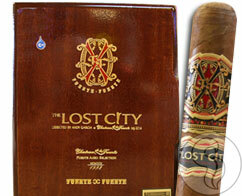 However, I prefer the Fuente Fuente Opus X to the Fuente Fuente Opus X… Lost City. I always appreciate reading your cigar reviews. They are informative and entertaining to read.